Unfortunately, honesty is a dying art in this world. We tell “little white lies” every day and think there’s nothing wrong with it. We mislead others with little or no thought to the consequences. We need to get back to honesty. Being honest isn’t always easy. There really is an art to telling the truth without sounding too harsh or heartless. It’s an art worth being adept at. We need to be honest with one another. We need to be able to trust each other. We need to be willing to accept the consequences of honesty, and know that it’s for the best to be truthful. Personally, I do my utmost to never lie. If I’m in a situation where the truth would be too painful I may say nothing or change the topic, but I won’t lie. Some people think I’m a … Well, I’ll leave out the expletive… for being so honest, but I’m okay with that. I know I’m doing the right thing. Lies only breed complication and mistrust in relationships, and they *always* come back to bite you sooner or later. Make it a point, from this day forward, to try to be more honest. If you’re not comfortable with that, at least endeavor not to lie. It makes you a better person, and creates a better world. Also, don’t accept lies from others. Encourage honesty in those around you. There’s no excuse for lying to people. Even if you think you’re saving them some pain now, they’ll suffer more pain later when they find the truth, coupled with the betrayal of having been lied to you. 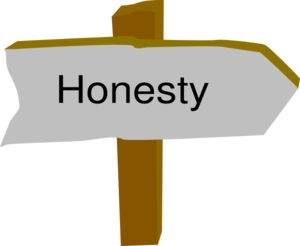 Are you truly honest with people? Can you be more honest than you are now?